Cinnamon is absolutely delicious in our lattes, but have you ever considered it may have incredible benefits for our health, and even our mental facilities? A new study published in the Journal of Neuroimmune Pharmacology found that mice fed cinnamon saw an increase a type of protein in the brain that helps with visual and memory learning and decreased a protein that inhibits learning. Since that means that it's possible eating cinnamon is like higher education, we should be eating more of it, no? What we eat really does matter. “This study solely focused on the ability of cinnamon to enhance the quality of learning. Cinnamon has been used for centuries as a medicinal spice, and was held at such a high regard that at one point in time in history, it was worth as much as gold,” says Alexandra Golovac, a culinary health educator and certified wellness and nutrition coach and chef at AG Nutrition Wellness. Cinnamon has so many wonderful qualities to enhance your health, but one specifically is brain health, performance — and in this case, learning. “One aspect of cinnamon is that it helps to reduce the oxidation caused by many factors, one being free radicals. Factors such as stress and the foods we eat all can damage our brain. Consuming cinnamon improves the brain’s ability to retain memory better. This means a lot when it comes to learning. If we consume on a regular basis cinnamon in dishes we prepare, let’s say rolled oat porridge with cinnamon, we can improve our brain function. “Something as simple as adding cinnamon can really improve the quality of your health, and in this case make you smarter,” says Golovac. *The Gnocchi in Cinnamon & Sage Beurre Noisette, a dish courtesy of Tim Sullivan, the executive chef of venues for Great Performances, is simple and straightforward recipe of potato flour and eggs. However, the added brown butter, cinnamon and toasted sage takes this recipe up a notch. *El Bolero Mexican’s Pan De Pulque French Toast is made with two pieces of Pan de Pulque soaked in organic milk, heavy cream, vanilla and cinnamon sugar. Then, it’s served with agave syrup and drizzled with sweet crema, lemon, lime zest and strawberries, “creating an unbelievably savory yet sweet take on French toast,” says Miguel Carcamo, Manager of El Bolero. *At Harold's Cabin in Charleston, Coffee Director Brianna Berry uses steeped spices and a burnt cinnamon stick to add dimension to cold brew. "I wanted to amp up the cold brew coffee in the spirit of Masala, which are typically found in chai,” Berry said. The spices used have been touted for their antioxidant and anti-inflammatory properties. Served in a frosty mason jar, the cold brew is finished with a smoked cinnamon stick (smoked using a blow torch), adding complexity that creates a memorable iced coffee. *In the Summer Farm Vegetable Biryani by Tim Sullivan, the executive chef of venues for Great Performances (GP), (https://www.greaterformances.com) the Biryani vegetables are the definition of flavor. Cinnamon combines with garlic, ginger, raisins and almonds along with other spices add a nice twist to eating your veggies. *New Brunswick, N.J. eatery The Frog and The Peach puts a twist on the classic Baba au Rhum by swapping out rum for cinnamon whiskey and adding varieties of Cinnamomum verum, spices far more distinct than what you’ll find at the supermarket. “The Baba Cake is garnished with a white chocolate that is infused with cinnamon, a ground cinnamon cake, fresh sage and some charred oranges for additional acidity and contrast. Lastly we make an orange-vanilla sorbet that cools and cuts through all the different cinnamon components of the dish,” says Pastry Chef Ben Deutsch of The Frog and The Peach. *The Nuts.com’s Tiger Nut Horchata recipe is similar to making nut milk: soak tiger nuts in cinnamon-infused water overnight, and by morning you’ll have a sweet, creamy and refreshing beverage packed with cinnamon flavor. And since tiger nuts are actually small root vegetables, the recipe is vegan, dairy-free and nut-free. favorite when it comes to convenient pastry desserts. The freshly made churros at Salsera are made out of dough and deep-fried where they are immediately given a generous sprinkle of cinnamon after they come out. Our cajeta dipping sauce is a favorite of customers, a sweet white cream that goes with everything, including our double espresso. 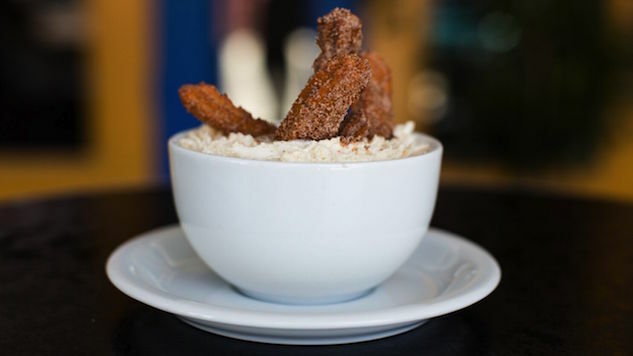 The churros are definitely not only mine, but our entire staffs favorite go-to on the menu,” says Carey Wilson, General Manager of Salsera. *Royale (https://royaleburgers.com/ ) may be known for their burgers, but their Brioche Bread Pudding Flux Cinnamon is exceptional paired with warm toffee and vanilla ice cream.